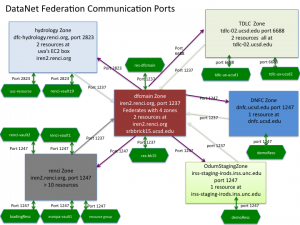 Data grids are defined by a data grid “zone” name, a port number through which the metadata catalog is accessed, and a host name for the server. These parameters may be stored in a .iRODS environment variable file. Data grids are highly controlled environments. All accesses are authenticated, and all operations are authorized. For each user account within a data grid, a user is given a personal collection space and control over sharing of their collection contents. The data may be distributed across multiple storage systems, replicated, annotated with descriptive information, and shared with individuals or groups. Through soft links, a logical collection can be formed that includes links to data stored in external data management systems. Currently soft links are supported for access to web sites, ftp sites, Z39.50 sites, SRB data grids, and iRODS data grids. Tickets are supported that control access by persons who do not have a data grid user account. The ticket specifies the number of accesses and the time duration during which specified files or collections may be accessed through web browsers or iRODS shell commands. 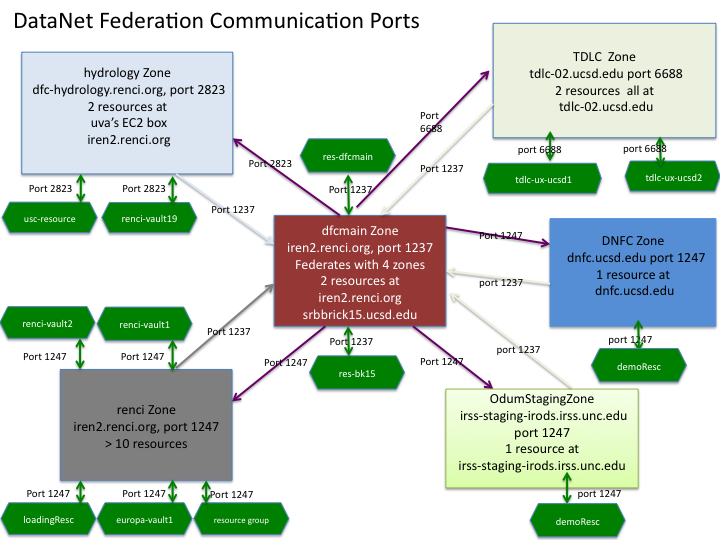 The DFC federation hub has the zone name “dfcmain”, is managed at the location iren2.renci.org, and uses port number 1237.